CES 2015: AKG unveils Quincy Jones-designed N90Q headphones | What Hi-Fi? 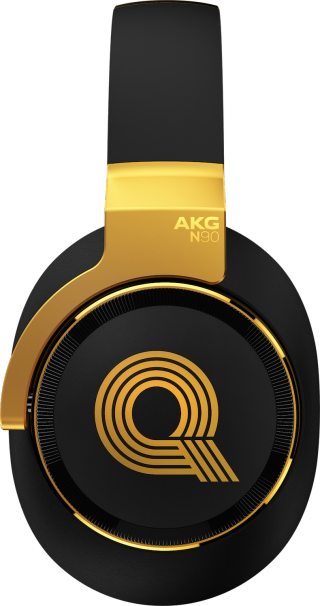 AKG's new N90Q over-ear headphones feature auto-calibration and have been designed with the help of the legendary music producer, Quincy Jones. Quincy Jones already has his own signature line of AKG headphones and the N90Q adds to that family. These over-ears feature AKG's new TruNote technology, which uses proprietary software (and two tiny microphones in each ear cup) to measure their frequency response and auto-calibrate while the headphones are in place. They're designed to optimise the sound for the inner ears of each individual. The N90Qs also use noise-cancelling and sound customisation technology - AKG claims the latter continually adjusts the bass and treble levels to reduce any distortion. Jones certainly believes the technology makes a difference. He said: "The enhanced experience provided by the AKG N90Q will offer the listener such exact sound and customisation that you will believe that you are in a professional recording studio." Quincy's daughter, Kidada, helped with the aesthetic and the finish of the headphones - and, according to AKG, is an established designer for Disney. Pricing is yet to be confirmed, but we'll be sure to let you know once we've received confirmation from the manufacturer. The N90Qs are scheduled to hit shops this summer.